Routine maintenance on your car is more than a soapy car wash at the end of the summer, or putting on your winter tires when the temperature drops. It’s more than filling up your gas tank at the pumps, and vacuuming the seats. Much like the average person, vehicles have a specific schedule that must be followed in order to run properly. Putting off vehicle maintenance is not recommended–unless you’re up for paying your local service department an arm and leg to fix issues down the road. Your Owner’s Manual that came with your vehicle purchase is the first place you should look, as different makes and models come with a varying set of instructions. 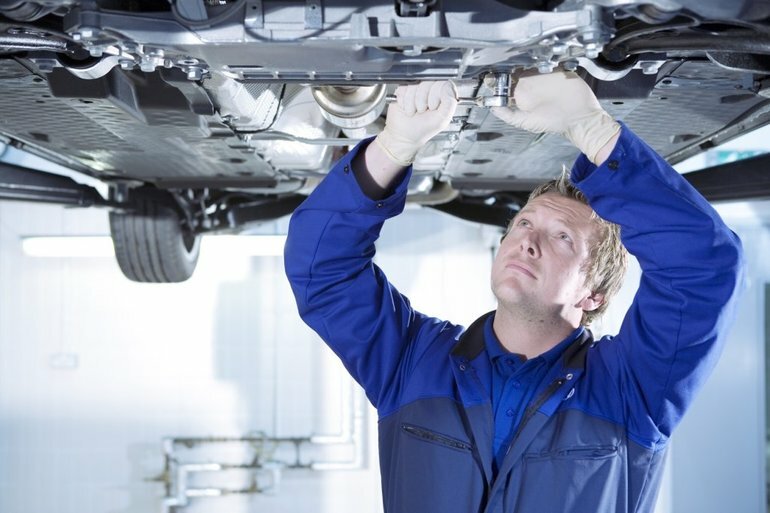 Although every vehicle is different, there are 10 major maintenance jobs that simply cannot be ignored. Your vehicle’s fuel filter is constantly running as soon as you start the ignition. Its job is to prevent particulates like dirt, dust and debris from clogging injectors. Over time, the fuel filter will need to be replaced to avoid contaminating your fuel, wasting mileage and preventing serious damage. Technicians recommend replacing it every 2 years or 24,000 miles. Nothing is scarier than losing control of the wheel. Check the fluids periodically using the dipstick located inside the compartment. When the time comes to replace your fluids, use only the brand suggested by the manufacturer and make sure your technician is aware. Experts recommend keeping an eye on these levels at every oil change, and top off the fluids when necessary. Cold winter days aren’t the only thing that will kill your battery. Most people don’t think to check this component of their vehicles until it’s too late. Batteries should be replaced every 48-60 months, and newer technologies on the market can offer you extended life and more consistent performance than the battery that came from the manufacturer. Your engine depends on clean air that is free of contaminants to work the most efficiently, so when your air filter is dirty or clogged, you waste fuel and mileage. Air filters should be replaced approximately every year, or when the interior of your car doesn’t smell as clean as it used to. Trans fluid fights friction and keeps things within safe operating temperatures, so that your vehicle can operate effectively without overheating and causing serious damage. Checking fluids periodically can prevent a hefty repair bill. The filter should be replaced approximately every 2 years, or earlier if deemed necessary by your mechanic. Spark plugs generate internal combustion within your vehicle’s engine by firing up the mixture of air and fuel in each cylinder. If your mileage begins to suffer, the engine runs poorly, or you fail your emissions test, worn out spark plugs could be to blame. Technicians recommend replacing the spark plugs every 30,000 to 100,0000 miles. Belts keep important components like your alternator and water pump active. The timing belt keeps certain valves from crashing into each other and if the belts begin to fail, it’s bad news. Interference between parts can lead to a major mechanical breakdown or a loss of progression out on the road. Changing your belts every 3 years for the engine belts and every 60,000 to 90,000 miles for the timing belt is highly recommended. The liquid in your radiator serves as an antifreeze and prevents corrosion in the cooling system. You should check coolant levels regularly and always use only the recommended coolant and water mixture ratio, which is generally the 50/50 rule. Your service provider will be able to help you with this. Coolant changes are recommended every 2 years. It sounds obvious, but there are many drivers out there who simply ignore what their tires are trying to tell them. The wear patterns on your tires show a number of things, like aggressive driving, bumpy road conditions, improper inflation or worn suspension components. Check your tires using a tread depth gauge and examine the inflation rate. Even tires that claim to be long-lasting should eventually be replaced, as by ignoring this, you could compromise your safety. Tires should be completely replaced once they reach their minimum tread depth. You should never drive without a safe brake system. Check your fluid levels every so often and keep an eye on the brake pad conditions. Replace your brakes immediately if you feel that your safety is compromised, or you have trouble bringing your vehicle to a complete stop. Regular professional service appointments are of the utmost importance if you want to keep your vehicle healthy, and get the most out of the car you love. At Crosby Volkswagen, we handle every kind of routine maintenance job for your Volkswagen, including the ones you might not even know about! Are you due for a service appointment? Book an appointment with the Crosby Volkswagen team today by calling (519) 894-9300!